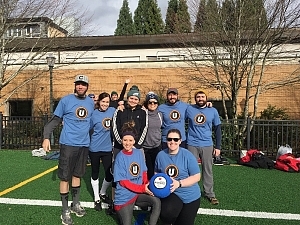 After a few months off, Ball Don't Lie (formerly a ton of different team names) were ready to kick Winter off right, and it all started with Tom Cogswell on the mound. Tom used every ounce of good fortune coming his way to throw bunter after bunter out on their way to first, seemingly throwing the ball blindly towards the area and letting the Force take over. Whatever Tom's intention, it worked, time and time again. Couple that with some timely kicks and some background tunes, and Tom captained his team to an opening day victory worth remembering! The KY hillbillies... and Brock!